The sounds of helicopters, of hushed speech and of crickets chirping, usher us into Steven Spielberg’s latest film The Post. The setting is Vietnam, and the year is 1966. The camera passes over soldiers being bandaged after battle, to a lone figure typing at a desk. This is Daniel Ellsberg (Matthew Rhys), and despite the buzz and activity surrounding him, he remains focused and composed, steadily recording his experiences. In the next sequence we see just one of these experiences: a platoon is slowly trudging through the Vietnamese forest. The setting is nocturnal and claustrophobic: the trees hem the soldiers in, and everything is bathed in a deep navy blue. Before long the foreboding silence is interrupted, and shots begin to sound out. We hear bullets ricocheting off tree trunks as soldiers quickly start to fall. Whilst never reaching the stomach-churning intensity of Saving Private Ryan’s infamous opening, the scene is still evocative and engrossing. It’s wonderfully captured in moody 35mm by cinematographer Janusz Kamiński, one of Spielberg’s long-time collaborators – it shows the way that war methodically uses up the bodies of those fighting it. On the plane back to America, we see Ellsberg in conversation with the Secretary of Defense Robert McNamara (Bruce Greenwood). He tells McNamara that nothing has changed, the war is going just as poorly. McNamara agrees with him. As the plane lands, McNamara speaks to the press and delivers a bald-faced lie: he assures them that the conflict is “showing great improvement.” This is too much for Ellsberg to take. As John Williams’ score begins to build in intensity, working in steady, driving percussion against low synth bass and swells of menacing strings, Ellsberg makes his way to an advertising agency after hours. There, he begins to photocopy classified US documents, with ‘Top Secret’ emblazoned on the bottom of each page. In a series of pans over the documents, Ellsberg reads out the contents of the reports, (for no one else’s benefit but ours), as archival footage of the famous public addresses of previous presidents flash on the screen. A slightly clunky and perfunctory way to convey the contents of the papers, to be sure, but the stage is set. The pieces have all been put into place – now to watch them slowly topple down. We flash forward to 1971. Kay Graham (Meryl Streep) is the owner of The Washington Post, and Ben Bradlee (Tom Hanks) is its editor. The paper is “cash poor” and giving away shares to make ends meet. The “modest paper [with] modest ambitions” is in a bit of a rut as far as reporting is concerned as well. They’ve been barred from covering Nixon’s daughter’s wedding and are dwarfed by the bigger papers around them, most notably The New York Times. A virtuoso tracking shot that moves through the offices of the paper, introducing us to some key players, brings us into this world in an instant. Spielberg is unafraid of holding these shots for long periods of time – a deft directorial touch that adds to our immersion and showcases the skill of his performers. It’s not long before The New York Times begins to leak the revelations from the documents we saw copied at the beginning of the film, documents that will come to be known as ‘The Pentagon Papers’, creating an enormous media sensation, and a great deal of annoyance in the offices of The Post. The headstrong and self-assured Bradlee immediately sets his staff the task of finding the papers, and so, the hunt is on. 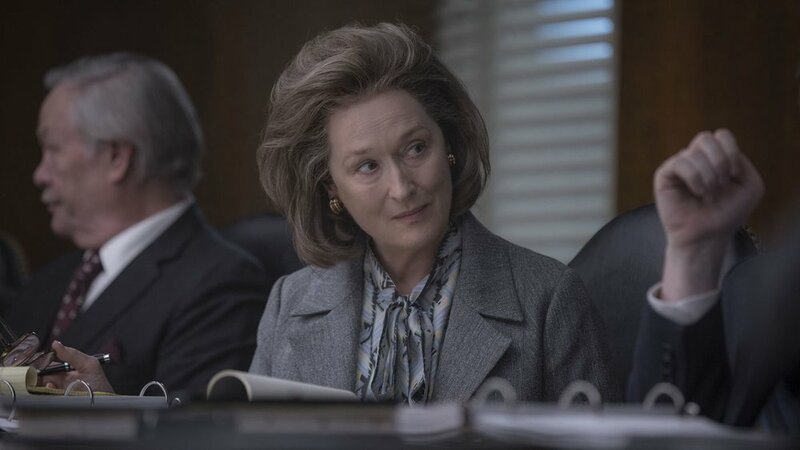 The Post is less the thriller that the film’s advertising campaign made it appear and is instead more of a moral drama. It's not entirely devoid of tension: a scene with one of The Post’s journalists Ben Bagdikian (Bob Odenkirk) on the phone to his source very clearly showcases the influence of the seminal All the President’s Men (1976) for instance. This influence is perhaps most keenly felt in the framing of Bagdiakn’s body as enclosed in the concrete pillars of a nearby parking complex (a reference to one of the key locales in the film). When we cut to close-ups of Bagdikan, the camera is constantly in motion, slowly tracking towards his face, as he checks over his shoulders in fear of being overheard. The paranoia is palpable. A later scene sees the journalist meeting with Ellsberg to discuss the by now notorious papers. The scene is punctuated by John Williams’ ominous score and the harsh lights of desk lamps, tilted up at the characters’ faces from low angles, instilling everything with a sense of grim portent. But these scenes aren’t what holds Spielberg’s film together. The broader moral questions that the film poses – chiefly about freedom of the press, and about their responsibility to uphold the principles of truth and justice above, (as the case here is) their own personal livelihoods – are very much Spielberg’s anchor. “If we can’t hold them accountable… who will?” Ellsberg asks at a pivotal moment in the film, and it’s this question that Bradlee and Graham must reckon with. The performances of Streep and Hanks are immediately striking. Streep portrays Graham’s nervousness and anxiety with great tact. It’s never cartoonish, but it’s always present – the polar opposite of the confidence and passion of Hanks' Bradlee. Graham's uncertainty is only doubled by the casual sexism of the time; there are numerous scenes in which Graham goes into board meetings and is the only woman there, her male colleagues quickly beginning to interject as she speaks, patronizing her and doubting her abilities. We see the mental impact of this constant criticism from her male co-workers, and the struggle she feels to make herself heard. Over the course of the film however, we begin to see Graham’s convictions calcifying as she ultimately overcomes it all. There’s something about the way Spielberg handles this material that unfortunately ends up feeling somewhat ham-fisted. Subtlety has never been Spielberg’s greatest strength, and The Post is no exception: the whole thing feels relentlessly on the nose. This is epitomized in a shot towards the end of the film that sees Graham descending the stairs of the Supreme Court as a group of young women gaze admiringly up at her, as if she were a vision descended from heaven. Some of the dialogue also feels very heavy-handed, a problem that I had with Bridge of Spies (2015), the previous Hanks-Spielberg collaboration, and this isn’t helped by Williams’ scoring, which can become too saccharine in some of the film’s more emotional scenes. Everything in The Post is spelled out for the viewers, and this is at the expense of the film’s depth. There’s so much directorial skill on show here – whether it’s the aforementioned long shots that Spielberg weaves seamlessly into his sequences, or the simple but effective staging in some of the central scenes: the shot of all the Post journalists crammed in beside each other as they open the box containing the Pentagon Papers for instance, or the way that the bodies of three or four men all crowd around Graham as she’s making her most important decision. But these important decisions are moral dilemmas, and moral dilemmas need more precision than Spielberg gives them here. As it stands, The Post is a very fine film, with a pressing message for the current time, but it stops just short of being a remarkable one.